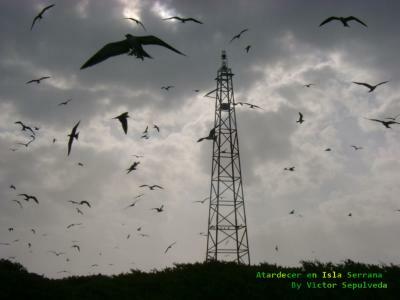 This page is for lighthouses of Colombia's island territories in the southwestern Caribbean Sea, including the inhabited islands of San Andrés and Providencia and a wide scattering of uninhabited banks, reefs, and cays. The islands of San Andrés and Providencia were settled by English sailors and English is still spoken commonly in the islands as well as Spanish. The islands have a population of about 60,000. They were formerly isolated and poorly known, but in recent years they have become a regular stop on the Caribbean cruise ship circuit. Nicaragua formerly claimed all these islands but surrendered its claims in 1928 in return for Colombia's recognition of Nicaragua's sovereignty over the Islas del Maíz (Corn Islands) and the Mosquito Coast of the mainland. Later Nicaragua attempted to renounce this agreement but in 2007 the International Court of Justice upheld the 1928 treaty establishing Colombian sovereignty. The Quitasueño, Serranilla, Serrana, Bajo Nuevo, and Roncador Banks were formerly claimed and occupied by the United States. The U.S. gave up its claims to the Quitasueño, Serrana and Roncador Banks in a 1981 treaty with Colombia. 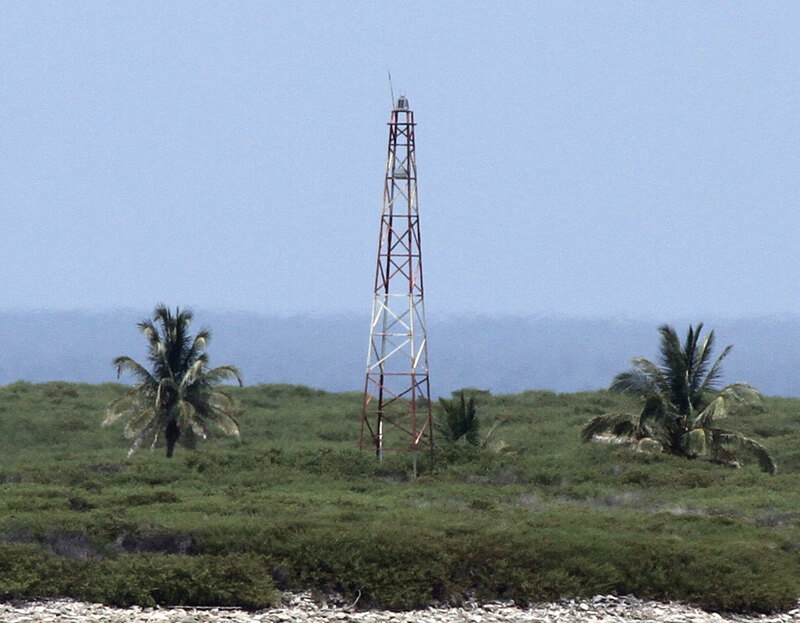 The U.S. claims to Serranilla and Bajo Nuevo are technically still in force although the U.S. is unlikely to pursue them. In November 1993 Colombia and Jamaica signed a maritime agreement establishing a zone of joint control around Bajo Nuevo and Seranilla but recognizing Colombian sovereignty over the two reefs themselves. Honduras gave up its former claims to Bajo Nuevo and Serranilla in a 1999 treaty with Columbia. Finally, on 19 November 2012 the International Court of Justice issued a final judgment in the dispute between Colombia and Nicaragua, establishing a maritime boundary between those countries and confirming once again Colombia's sovereignty over the disputed islands. This brings us very close to a complete resolution of the territorial disputes. Colombia has incorporated all the disputed banks into its Departamento del Archipiélago de San Andrés, Providencia y Santa Catalina. 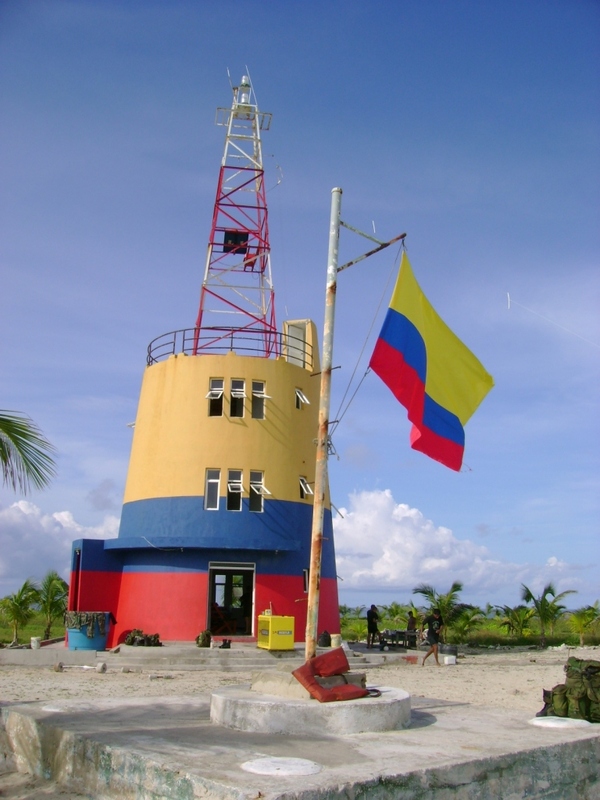 Aids to navigation in Colombia are owned by the Autoridad Marítima Colombia and maintained by the Dirección General Marítima (DIMAR). The Spanish word for a lighthouse is faro. In Colombia this word is used for the larger light towers, while a smaller light is called a baliza (beacon). ARLHS numbers are from the ARLHS World List of Lights. DIMAR numbers are from DIMAR's Lista de Luces de la República de Colombia. Admiralty numbers are from volume J of the Admiralty List of Lights & Fog Signals and U.S. NGA numbers are from Publication 110. An informative site posted by DIMAR's oceanographic and hydrographic center (Centro de Investigaciones Oceanográficas e Hidrográficas, or CIOH). From CIOH, two lighthouse slide shows. Photos taken in December 2008 by Rosalie Beasley; the last 14 photos are from San Andrés. The official Colombian light list, Lista de Luces, is available for download in pdf format. 2008 (station established 1982). Active (? ); focal plane 22 m (72 ft); two white flashes every 15 s. 21 m (69 ft) square skeletal tower with gallery, painted with red and white horizontal bands. A DIMAR photo is at right, but the lighthouse is not seen in Bing's fuzzy satellite view. Bajo Nuevo is a complex of two reefs far out in the Caribbean southwest of Jamaica. The Admiralty lists the light under Honduras, but Honduras gave up its claims to Bajo Nuevo and Serranilla in a 1999 treaty with Columbia. Located on Low Cay, the largest islet of the reef. Accessible only by boat. Site and tower closed (special permission required for landing). ARLHS SAP-001; DIMAR 399; Admiralty J6020; NGA 15818. 1996 (station established 1977). 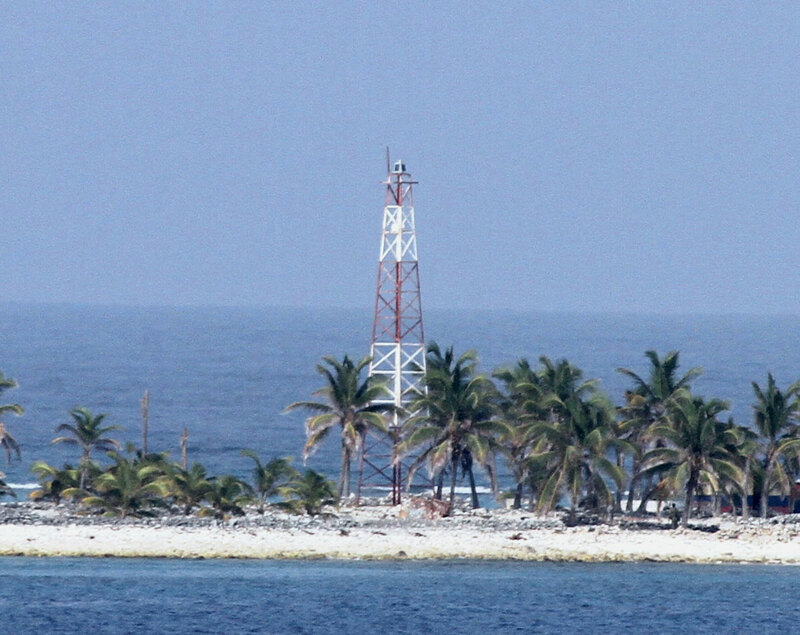 Active; focal plane 33 m (108 ft); two white flashes every 20 s. 33 m (108 ft) tower, including a square pyramidal skeletal tower mounted atop a 3-story concrete crew quarters. The crew building is now painted in the colors of Columbia's flag: upper half gold, lower half with one blue and one red horizontal band. 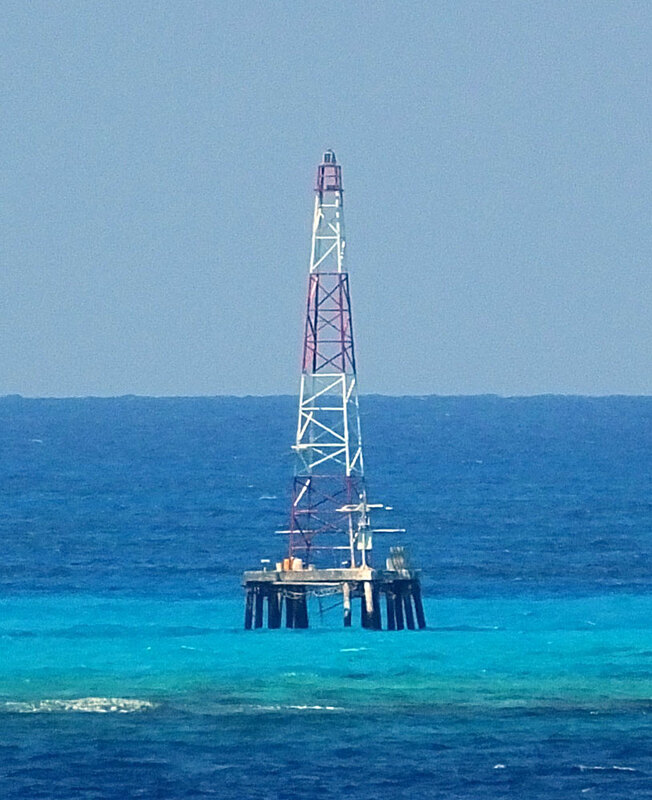 The skeletal tower is painted with red and white horizontal bands. A DIMAR photo is at the top of this page, another good photo and a portfolio of photos are available, and Google has a satellite view. 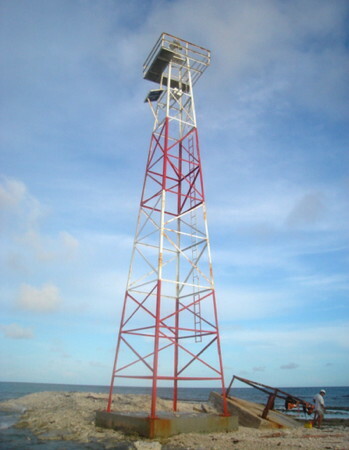 The lighthouse was designed by Guillermo Fonseca Truque. Banco Serranilla is a reef about 110 km (70 mi) west of Bajo Nuevo and about 350 km (220 mi) northeast of the Honduran coast. Located on Beacon Cay, the largest islet of the reef. Accessible only by boat. Site and tower closed (special permission required for landing). ARLHS SAP-013; DIMAR 400; Admiralty J6024; NGA 15816. 1977 (station established by the U.S. in 1919). Active; focal plane 23 m (75 ft); two white flashes every 15 s. 23 m (75 ft) square skeletal tower, painted with red and white horizontal bands and mounted on a square platform supported by piles. Trabas has a photo by Capt. 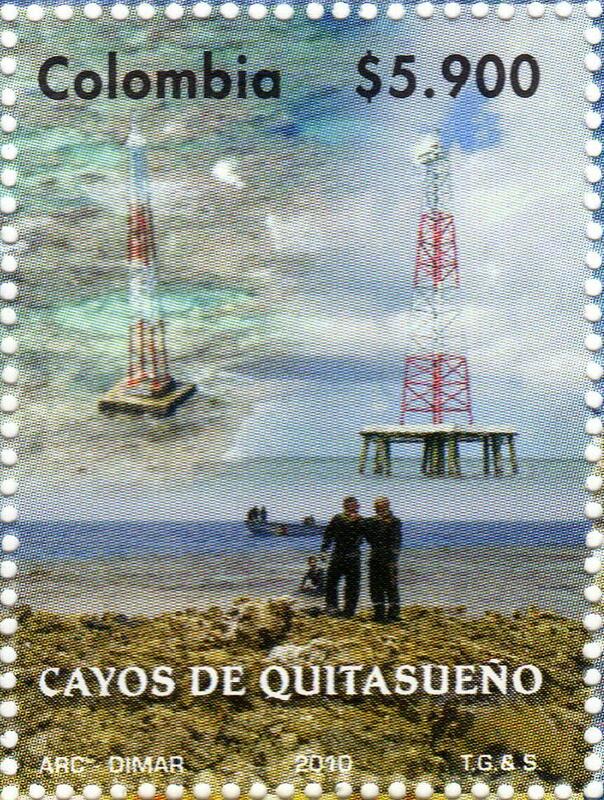 Peter Mosselberger, and a 2010 Colombian postage stamp shows both Quitasueño lighthouses, but Google's satellite view does not show this reef at all. Banco Quita Sueño is a reef about 110 km (70 mi) north northeast of Isla Providencia and 70 km (45 mi) west of Banco Serrana. The reef has no dry land. Located at the north end of the reef. Accessible only by boat. Site and tower closed (special permission required for landing). ARLHS SAP-009; DIMAR 401; Admiralty J6028; NGA 15820. 2008. Active; focal plane 20 m (66 ft); white light, 2 s on, 10 s off. 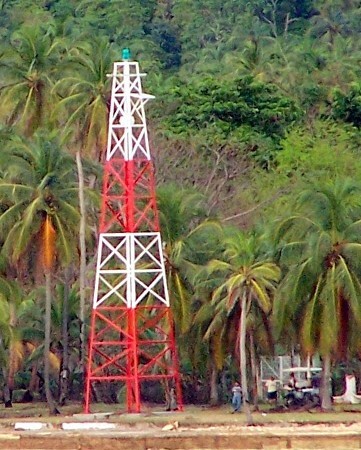 20 m (66 ft) square skeletal tower, painted with red and a white horizontal band and mounted on a square platform supported by piles. Trabas has a photo by Capt. Peter Mosselberger and a 2010 Colombian postage stamp shows both Quitasueño lighthouses. Located at the south end of the reef. Accessible only by boat. Site and tower closed (special permission required for landing). DIMAR 402; Admiralty J6030; NGA 15821. 1977 (station established by the U.S. in 1919). 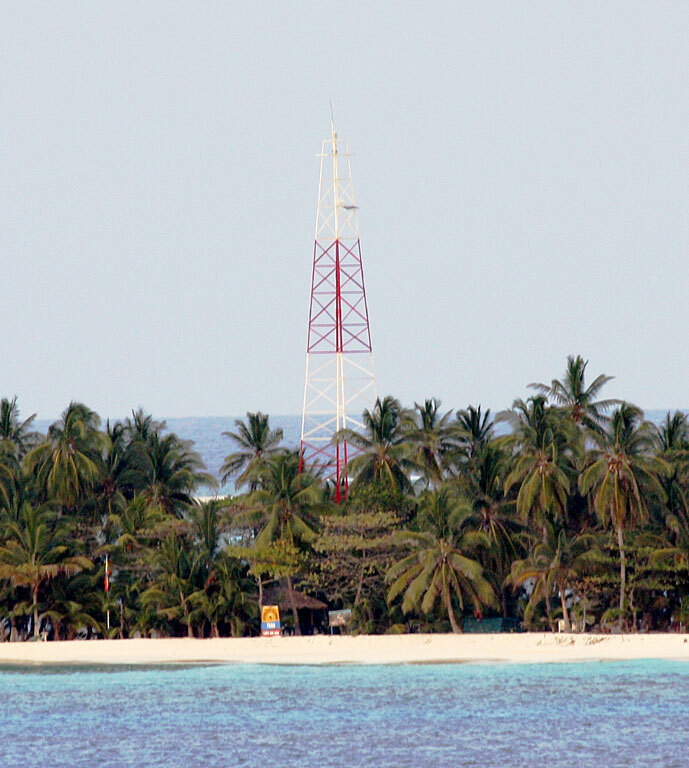 Active; focal plane 24 m (79 ft); white flash every 10 s. 25 m (82 ft) square skeletal tower, painted with red and white horizontal bands. Concrete keeper's quarters. Victor Sepulveda has a photo, CIOH has a photo in its lighthouse slideshow, Trabas has a photo by Capt. Theo Hinrichs, and Google has an indistinct satellite view. Banco Serrana is an atoll about 360 km (225 mi) east of Nicaragua. Located on Southwest Cay. Accessible only by boat. Site and tower closed (special permission required for landing). ARLHS SAP-012; DIMAR 403; Admiralty J6034; NGA 15824. 1978 (station established by the U.S. in 1919). Active; focal plane 24 m (79 ft); white flash every 11 s. 24 m (79 ft) square skeletal tower, painted with red and white horizontal bands. Trabas has a photo by Capt. Theo Hinrichs, and Wikipedia has a distant view, but Bing has only a fuzzy satellite view of the cay. Wolfgang Schippke claims the original (U.S.?) lighthouse stands abandoned nearby, but there's no sign of this in available photos. Banco Roncador is about 215 km (135 mi) northeast of San Andres. Located on a tiny cay at the northernmost point of the reef. Accessible only by boat. Site and tower closed (special permission required for landing). ARLHS SAP-010; DIMAR 404; Admiralty J6038; NGA 15828. Date unknown. Active; focal plane 20 m (66 ft); white flash every 10 s. 20 m (66 ft) square pyramidal steel skeletal tower, painted with horizontal red and white bands. A closeup photo is at right, and Luis Quintana Barney has posted a good photo, but Google's satellite view does not show the cay. Located on a low reef about 14 km (9 mi) north northeast of Isla Providencia. Accessible only by boat. Site open, tower closed. ARLHS SAP-006; DIMAR 405; Admiralty J6041; NGA 15832.7. 1993. Active; focal plane 25 m (82 ft); one long (1.5 s) white flash every 10 s. 18 m (59 ft) square pyramidal steel skeletal tower, painted with horizontal red and white bands. CIOH has a photo in its slideshow and Google has an indistinct satellite view. Located on an islet off the northernmost point of Isla Providencia. Accessible only by boat. Site open, tower closed. ARLHS SAP-007; DIMAR 406; Admiralty J6041.5; NGA 15832.5. Date unknown. Active; focal plane 67 m (220 ft); two white flashes, separated by 4 s, every 14 s. Approx. 20 m (66 ft) square pyramidal steel skeletal tower, painted with horizontal red and white bands. No photo available but Bing has an indistinct satellite view. Located on the heights at the southern tip of Providencia. Site status unknown. ARLHS SAP-005; DIMAR 407; Admiralty J6042; NGA 15832. Date unknown. Active; focal plane 20 m (66 ft); white flash every 9 s. 20 m (66 ft) square pyramidal steel skeletal tower, painted with red and white horizontal bands. CIOH has a photo and Google has a street view and a satellite view. Hoyo soplador (blowhole) refers to a nearby occurrance of that phenomenon. Located at the southern tip of the island. Site open, tower closed. ARLHS SAP-008; DIMAR 395; Admiralty J6043.6; NGA 15835. Date unknown. Active; focal plane 21 m (69 ft); red flash every 5 s. 20 m (66 ft) square skeletal tower with gallery, painted with red and white horizontal bands. Beasley has a photo and Google has an indistinct satellite view. 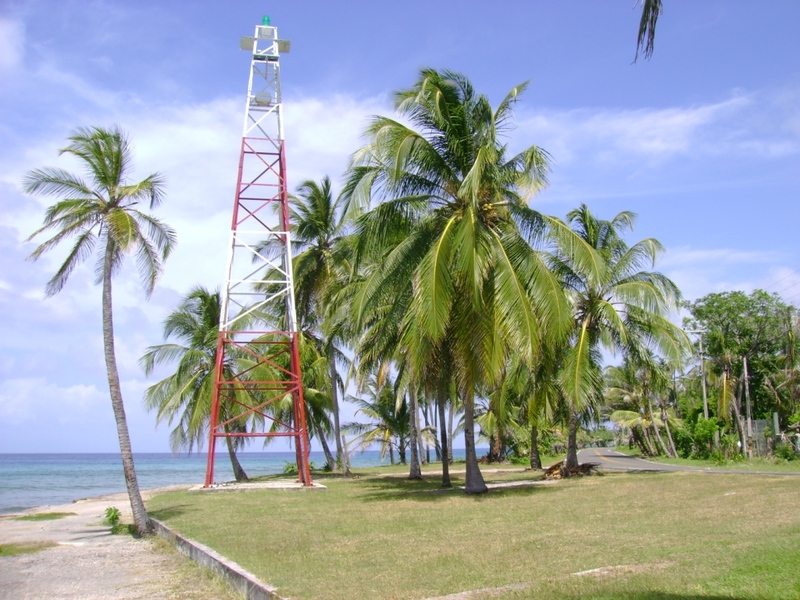 El Cove (The Cove) is a section of the southwestern coast of San Andrés where there is deep water close to shore and larger vessels can anchor. Located on the beach about 8 km (5 mi) north of Punta Sur. Site open, tower closed. ARLHS COL-039; DIMAR 394; Admiralty J6043.7; NGA 15835.5. Date unknown. 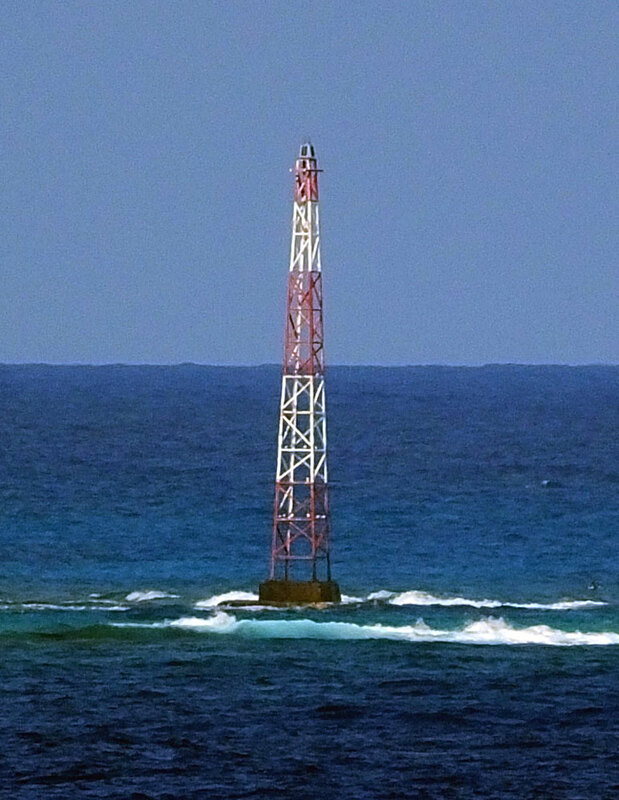 Active; focal plane 21 m (69 ft); green flash every 3 s. 20 m (66 ft) square skeletal tower with gallery, painted with red and white horizontal bands. Beasley's photo is at right, a closeup is available, and Google has a street view and an indistinct satellite view. Located on the beach at a promontory about 2 km (1.2 mi) north of the El Cove light. Site open, tower closed. ARLHS COL-041; DIMAR 396; Admiralty J6043.8; NGA 15835.7. 1990. Active; focal plane 23 m (75 ft); yellow flash every 5 s. Approx. 20 m (66 ft) square pyramidal steel skeletal tower, painted with red and white horizontal bands. Diego Azuaga has a good 2007 photo, CIOH has a photo, a portfolio of photos is available, and Google has a fuzzy satellite view. Located on the highest point of Haynes Cay, off the east coast of Isla San Andrés. Accessible only by boat. Site open, tower closed. ARLHS SAP-002; DIMAR 392; Admiralty J6043.5; NGA 15834. 1968. Active; focal plane 37 m (121 ft); white flash every 15 s. 29 m (95 ft) tower, presumably skeletal, painted orange. Trabas has a photo by Capt. Theo Hinrichs, and a portfolio of photos is available, but Bing has only a very fuzzy satellite view of the reef. Located on Cayo Bolívar, one of several small cays in the Cayos del Este Sudeste (East Southeast Cays) about 22 km (14 mi) east southeast of Isla San Andrés. Accessible only by boat. Site open, tower closed. ARLHS SAP-004; DIMAR 393; Admiralty J6044; NGA 15840. 1980. Active; focal plane 30 m (98 ft); two white flashes every 20 s. 29 m (95 ft) square skeletal tower with gallery, painted with red and white horizontal bands. This is a staffed naval station with several 1-story station buildings. CIOH has a photo and Bing has a satellite view of the station. Albuquerque is a reef about 35 km (22 mi) southwest of Isla San Andrés. 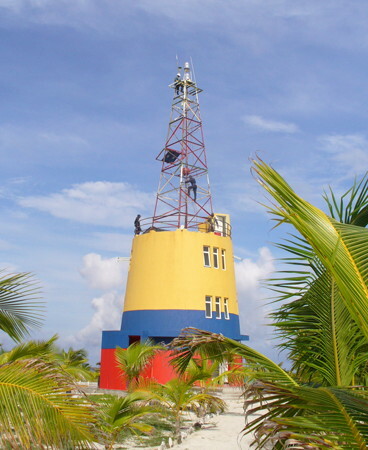 The lighthouse is on Cayo del Norte, the larger of two small cays at the south end of the reef. Accessible only by boat. Site open, tower closed. ARLHS SAP-003; DIMAR 398; Admiralty J6045; NGA 15844. Posted February 13, 2004. Checked and revised February 19, 2019. Lighthouses: 16. Site copyright 2019 Russ Rowlett and the University of North Carolina at Chapel Hill.